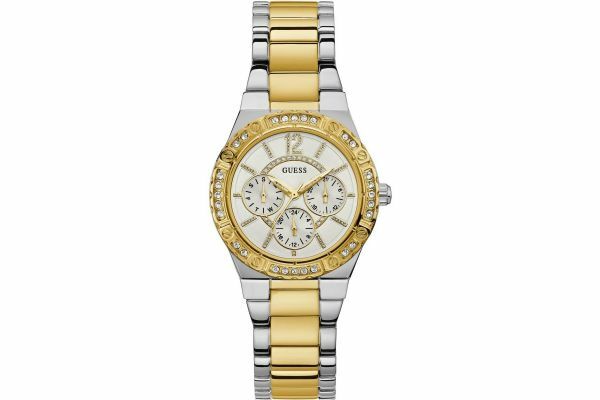 This eye catching women's watch is brought to you by Guess as part of their Envy collection. Featuring an oversized 36mm stainless steel case with a gold plated crystal adorned bezel, the Envy watch lives up to its name. Beneath protective mineral glass lies the stunning silver sunray dial, with crystal set hour markers and three sub-dials presenting the day, date and 24 hour clock. Gold dauphine hands and second hand complete this alluring dial. Set upon a polished stainless steel link bracelet with gold plated centre links, the Envy watch is enigmatic in its aesthetic. Secured by a fold over clasp with push deployment release the Envy by Guess is as comfortable as it is stylish. Powered by Quartz movement and water resistant to with stand light rain and handwashing this watch is the ideal accessory for both formal and casual attire. 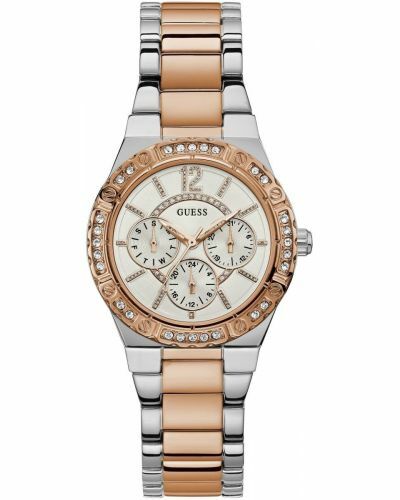 For us to size your new Guess Envy watch as accurately as possible, please take a look at our downloadable Watch Sizing Guide.